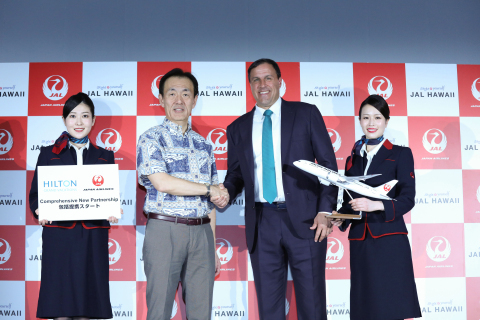 Japan Airlines and Hilton Grand Vacations have announced a comprehensive plan to develop new programmes and services that capitalize on HGV’s vacation ownership and JAL’s Hawaii flight experience. These premium brands will work together to grow travel between Japan and Hawaii, as well as broaden options for enhanced vacation experiences in Hawaii. The expanded relationship between HGV – a leading vacation ownership company with a strong global presence and resorts in both Hawaii and Japan – and JAL – an international airline – is expected to provide an elevated experience for travellers. This collaboration is in response to the increasing needs of Japanese travellers seeking memorable vacation experiences in Hawaii. According to the Hawaii Tourism Authority, more than 1.5 million Japanese visitors travelled to the Hawaiian Islands in 2018, making Hawaii one of the leading vacation destinations among Japanese travellers. Specifically, HGV-related travelers from Japan represented 8 % and 16 % of arrivals in Oahu and the Big Island of Hawaii, respectively.